Prize-giving to the Youth African Champions by the AUDA-NEPAD CEO, Ibrahim Mayaki (center) in Johannesburg, April 10. 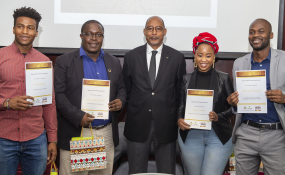 Johannesburg, April, 11 2019 - During an advocacy ceremony in Johannesburg, South Africa, the African Union Development Agency-NEPAD gave awards to five distinguished African Youth Champions for their contribution to Africa’s progress towards the goals of Agenda 2063. On this occasion, five young Africans who won ‘#TheAfricaWeWant Youth Essay Contest’ were also announced.